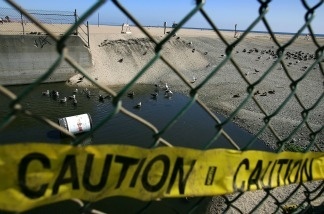 Birds bathe near a trash can where the public is warned to stay out of the water in an area harboring high bacteria levels near a drain at Will Rogers State Beach in 2007 in Pacific Palisades, California. It’s an unfortunate annual rite of passage for the sun kissed Southern California coast: the beach report card that judges water quality in the Pacific Ocean just off of our famous coastline, is usually filled with more bad news than good. Especially after a very rainy winter with loads of storm runoff, levels of pollutants at these beaches are high. Water quality at Los Angeles County beaches, in particular, has worsened over the past year, with Topanga beach, at the mouth of Topanga Creek, rating as one of the worst beaches in the state. It’s not all bad—Santa Monica Pier, a historically dirty beach, earned an “A” on the Heal the Bay report card, marking a dramatic turn around. There’s other ominous news off of California coasts, as old dumping grounds of mercury and PCB’s are resulting in high levels of the toxins being found in sport fish like sharks. One of the biggest “superfund” environmental clean up sites in the country lies just off of Palos Verdes, polluted for years by PCB and DDT runoff. What will it take to make our beach environments clean and safe? What marine life most needs protection? 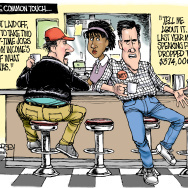 Tell us.